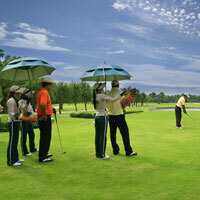 A 45-minute drive from downtown Bangkok and 15 minutes past Don Muang lies one of the most famous courses in Thailand. The 27 hole - South (the Meadow), North (the Lake) and West (Forest) - Yoshihira Aihara designed course was host to the 1994 Thailand Open and the 1992 Johnnie Walker Classic International Tournaments. The North Course ('The Lakes') has many water hazards & resembles golf courses typical of the United States. The South Course ('The Meadow') features mounds and water hazards and is reminiscent of Scottish courses. The West Course (the Forest) is notable for its profusion of trees and shrubs.